With blessings of Shri Goverdhannathji, Shri Mahaprabhuji and Shri Yamunaji, 29th September 2012 marked a significant day in the history of Atlanta, GA. Vaishnavs who traveled from across the USA observed the bhoomi pooja (ground-breaking) rites, a first step in the construction of the haveli. The grand project would comprise a beautiful temple featuring a seamless blend of the best of traditional Indian haveli architecture and modern technology, with exhibition halls and a guest house. Upon completion, the “Dream Haveli” will be the place where Vaishnavs can have a common place to worship Shreenathji and conduct various cultural activities in their own center. 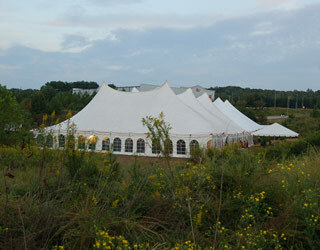 Tent at the ground-breaking ceremony for the Gokuldham Haveli in Atlanta. It was a grand four-day celebration, beginning with Patotsav on Thursday September 27th. The next three days of festivities were arranged at the Gokuldham’s new location. A beautiful tent was set up to accommodate more than 1000 expected vaishnavs. 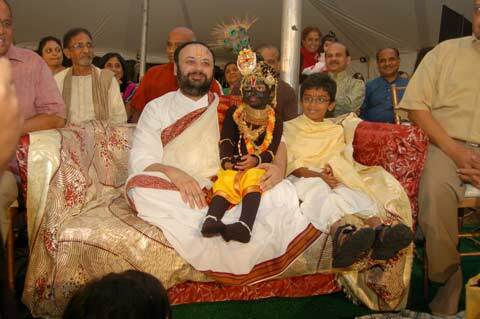 More than 1200 vaishnavs and well-wishers came from far and wide. The Sangeet Sandhya program was in the evening on Friday September 28th where a play was performed by Gokuldham kids followed by a beautiful program of Shreenathji bhajan sandhya. The final day was dedicated to kids of Gokuldham. Shree Dwarkeshlalji taught the children how to do seva of Lalo (baby Krishna) and presented them with small statues of Lalo to take home. More than 200 volunteers gave their time to this event. From its small beginnings in 2009, the Gokuldham organization has come a long way, celebrating vibrant festivals and spreading the knowledge of pushtimarg (the path of grace).